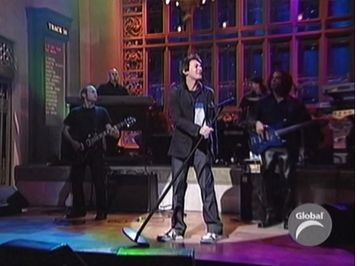 February 7, 2004 was a typical Saturday night. 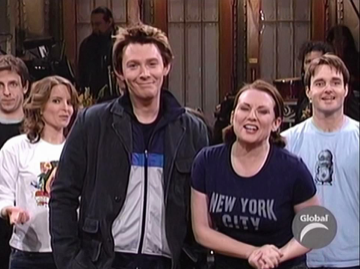 At 11:30pm, televisions all over the US switched to NBC to watch the popular show, Saturday Night Live. 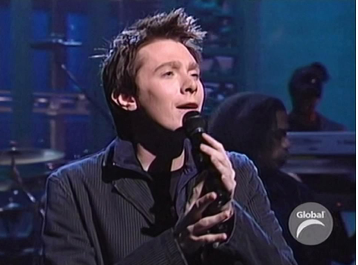 The guest host of the evening was Megan Mullally, but the star of the evening was Clay Aiken. 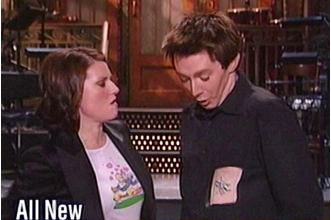 The preceding week, NBC teased their audience with lots of fun promos for the show and each one showed Clay just being his “funny” self. There was even one with a “pasty” that was a parody on the Super Bowl Halftime Show. Clay was actively involved throughout the show. One of the highlights was a skit about getting into the Grammy Awards. 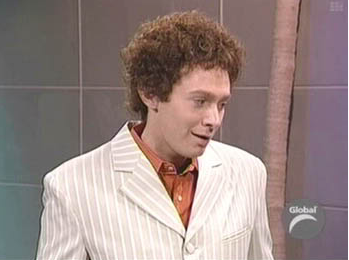 The ill-fitted suit, the curly wig, the exaggerated accent and especially the “Aiken Wink” made Trey Aiken and the skit a highlight of the entire season. Besides acting, Clay sang “Invisible” and “The Way.” When the show was over, it was fun to see all the cast hugging each other and congratulating Clay for the great job that he did. Did you watch this show?? We did watch this show – Clay really showed right off that he had the makings of a star and it was really fun. Never saw the promos before. Thank you so much for the video and the always great photos. Loved reading in his book, LTS, – his telling of that special night! I could hardly wait for this show to air that special Saturday! Oh what fun this was! I was hoping someone had a posting of the show and see it again! Thank you, CANN! I did watch the show and taped it on a VHS tape. Can't play it anymore. Never did see the promos so thanks for posting them now. Trey Aiken sure was funny. Thank you for the short video. I do remember the show. I wish they would rerun the show. I would like to see Clay again. Error: Error validating access token: Session has expired on Tuesday, 21-Aug-18 16:13:01 PDT. The current time is Thursday, 25-Apr-19 18:00:56 PDT.